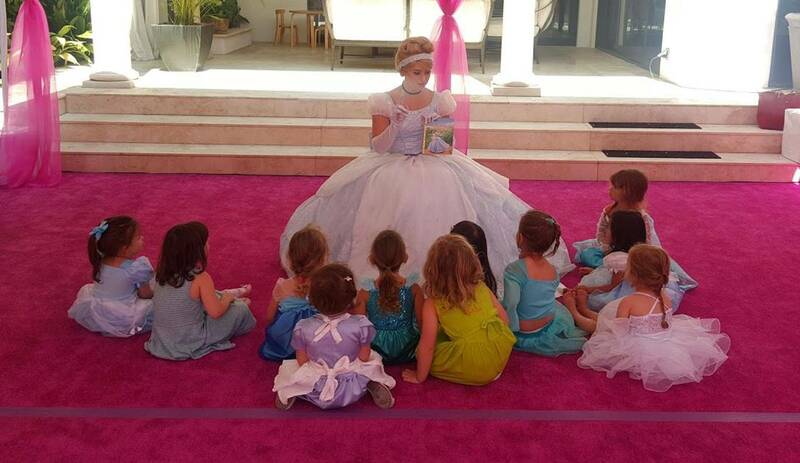 Join us for a magical summer of imagination, kindness, and princesses. Featuring a new character every day, crafts, games, & so much more! What's Included in Princess Camp? 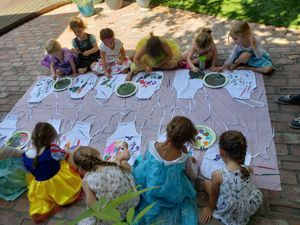 Lots of fun crafts, games, and activities that encourage good manners, team work, confidence, and self expression. Daily snack, lesson, and free play. Hosted in the comfort of your home with your child's friends. 20 hours of supervised princess play! We require a minimum of 10 full time campers registered by a month before start date in order to move forward with a camp date. Maximum of 15 campers. Camp hours are 8:30am-12:30pm unless otherwise noted in your introduction email by the host. Does your child have any special personal or dietary needs? What characters would your child like to meet at camp? Will anyone else be dropping off or picking up your camper? If so please list his or her full name, phone number, and the date(s) they will be picking up or dropping off. Thank you for completing the Princess Camp registration form. We will send you a confirmation email shortly. Click the link below to process your card through PayPal or call us at (818) 305-4539 and we'll process your card through Square. Q. What do you do each day at camp? Each day has a unique theme that coordinates to the princess guest. 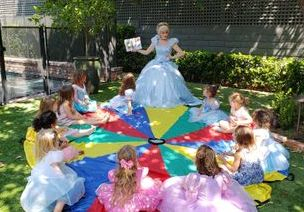 That theme is carried throughout the individual craft, snack, group craft, games, and princess story time. Our camp encourages good manners, team work, confidence, and self expression through fun, imagination and sharing. Q. When is Pick Up / Drop Off? Drop off is the first 30 minutes of camp (usually 8:30-9:00am) and pick up is the last 30 minutes of camp (usually 12:00-12:30pm). Only the parent who completes the Registration Form is permitted to pick up and drop off a child. ID must be presented upon pick up and drop off. 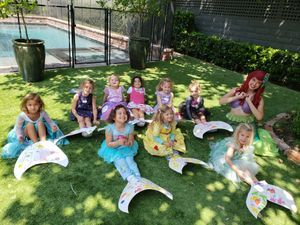 If a parent wishes someone else to pick up or drop off their child, the request must be emailed to PrincessAndMePartiesLosAngeles@gmail.com at least 12 hours before the requested time. Q. Can I Stay and Watch? We do not allow parents, guardians, and care takers to stay the entire camp. This is your time to enjoy a little down time! However, we are understand that the majority of children are quite young so parents and guardians are permitted to stay for the first half hour during the "drop off" period. Worried you'll miss something? Don't worry. 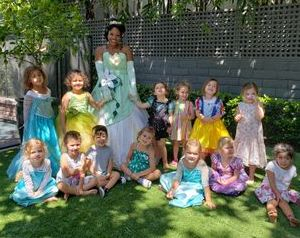 We do take photos throughout the day and of each child posed with the character so you can relive the day and see all the fun we've had. WATER. 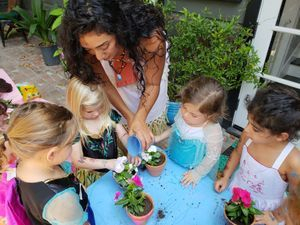 Your little ones will be playing outdoors the majority of the time. You do not need to provide anything else for your child during camp. We provide all the supplies necessary. They will be taking home a craft each day. Please label every item with your child's full name. Cubbies are provided for the campers. We accept Visa, Mastercard, American Express, and Discover through our providers Square and PayPal. Q. Does my child have to be potty trained? Yes, your child must be potty trained to attend camp. So sorry but we are not licensed for diaper changing. Thank you for understanding. We'll see your child next year. Yes we are licensed and insured. Documents can be provided upon request. Q. What kind of snacks do you provide? 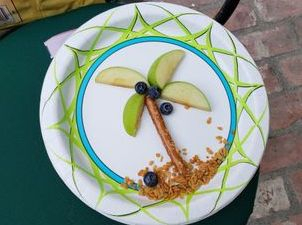 We provide healthy snacks that are also a craft. For example: "ants on a log" with celery, almond butter, and raisins. We do not provide snacks with peanuts. Please let us know of any allergies. Q. What kind of discipline system do you enforce? We use a rewards based discipline system with positive reinforcement and a treasure box. Once camp starts, your payment is non-refundable. We do not do partial payments or prorated rates. The only exception to this is if a camp is cancelled due to failure to meet to the registration minimum of 10 campers. Then the payment will be refunded in full. This can take up to 4 days for Square and PayPal to process. Q. What is your counselor to child ratio? Our camp child limit is 15 children. We have 2 counselors and 1 princess each day. Q. I'm interested in hosting. What do I need to do? 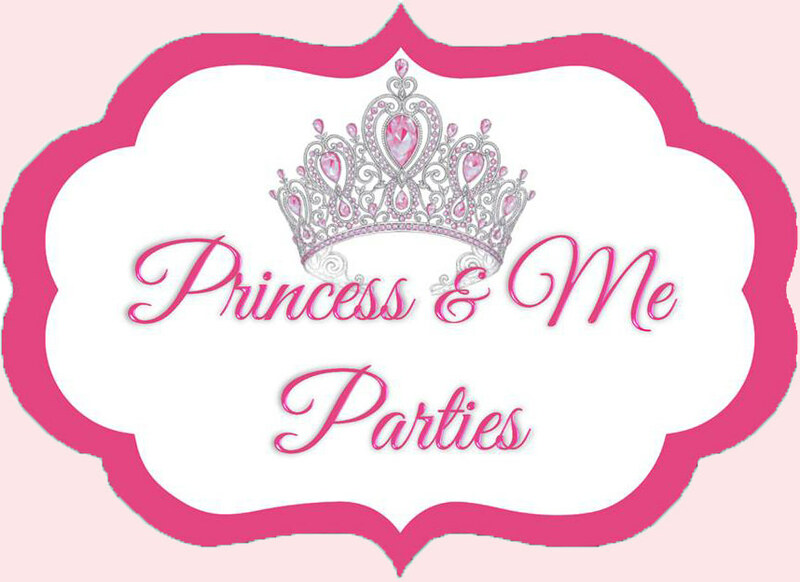 If you're interested in hosting, please email us at PrincessAndMePartiesLosAngeles@gmail.com or call us at (818) 305-4539. We require at least 8 children per camp and at least 5 weeks notice. Camps are held at your home in a child safe space. Once we have a date set, start inviting your friends and prepare for a week of fun.